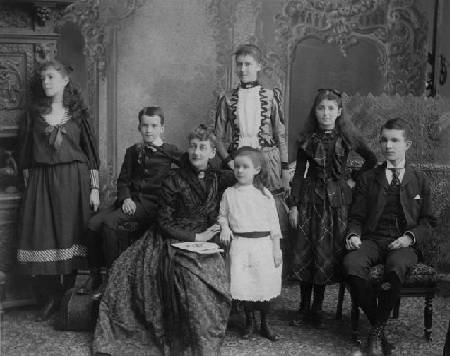 Click on a child in the image or on the name below for a brief biographical sketch of each of the six McQuesten children and some details about their relationship with their mother from the time of their father's sudden death and bankruptcy in 1888. Calvin's link will lead to a more extensive biography and his writings. If you are unsure which child is which, hover your cursor over the child and their name will appear. Mary's letters clearly demonstrate that she, in her matriarchal fashion, assessed each of her children's capabilities according to the family's needs, and guided them accordingly. Mary B. McQuesten was married in 1873 and had seven children in twelve years. The seventh child, Muriel Fletcher McQuesten (1880-1882) died at the age of 21 months. None of the McQuesten children married. Their home, Whitehern, intact with all family contents, opened as a museum of the city of Hamilton in 1971.